There is always something to be thankful for, especially when you’re spending Thanksgiving on the Outer Banks! With amazing local seafood, top restaurants, and great family fun, it’s time to start a new Thanksgiving tradition here on the beach! Check out some of the amazing local restaurants ready to serve you and your family this Thanksgiving! Enjoy fresh, local seafood, vegetables, choice meats, and so much more at Argyles! Argyles will be serving a buffet style Thanksgiving meal with over 25 different items to choose from! The buffet will be $31.95 for adults and $14.95 for children under the age of 10. The buffet starts at 11 AM and ends at 4 PM. You can view their menu here and reservations can be made by calling them at (252)-261-7325. 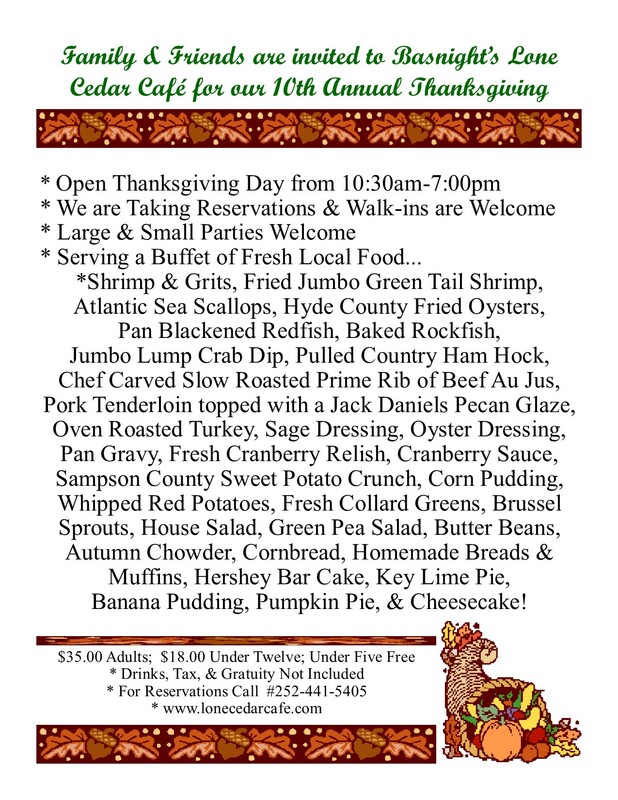 Bringing you Southern Coastal Cuisine, Owens’ Restaurant is serving a buffet style Thanksgiving Dinner along with special menu options. Dishes like baked local rockfish, Biltmore honey and brown sugar Carolina ham, Miss “O’s” Crabcakes, and so much more are available for your choosing. You can view the entire menu here. Prices are $34.95 for adults, $17.95 for children ages 6-12, and children under 5 eat free. For more information call 252-441-7309 or visit Owen’s website. This family owned and operated restaurant provides the perfect setting for your Thanksgiving meal. With choices on the buffet ranging from fresh fried green tail shrimp to pecan glazed pork tenderloin, there is sure to be something to suit everyone in your party. Buffet opens at 10:30 AM and ends at 7:00 PM. To view the complete menu, click here. Dish prices are $35 for adults, $18 for children under 12, and children under five eat free! For more information, visit Lone Cedar’s website. Mulligan’s Restaurant is famous for their burgers, but they have a rave-worthy Thanksgiving buffet too! With options like shrimp and grits, Oysters Rockefeller, carved turkey, and so much more, you will gobble til you wobble! The entire menu can be viewed here. Prices are $32 for adults, $26 for seniors, and kids 10 and under $16. For more information and reservations call Mulligan’s at 252-480-2000 or visit the Mulligan’s website. Kelly’s Restaurant offers a traditional Thanksgiving buffet for friends and family to enjoy! The buffet prices are $38 for adults, $29 for senior, $14 for children ages 5-12, and children under 5 are free. Kelly’s is now taking reservations by phone at 252-441-4116. For more information, visit Kelly’s website. The Lifesaving Station located in Duck serves a 5-course meal on Thanksgiving day. Featuring dishes like Blue Crab quiche, slow roasted free-range turkey, and so much more, you can’t go wrong with choosing the Lifesaving Station for your Thanksgiving meal! Meal price is $55 per adult and $25 for children ages 4-12. To view the entire menu, click here. Call them at (888) 714-3625 to make reservations for you and your group.